by Dave from The Longest Way Home ~ April 25th, 2011. Updated on October 5th, 2013. Published in: Travel blog » Malaysia. What happens at the Petronas towers when it closes? You’ve gone up to the skybridge and back down. You’ve asked if you can go further up, and been told no. 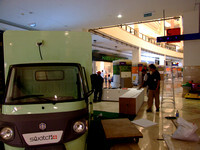 So, you shop till you drop all day at the giant Suria shopping mall under the iconic Petronas towers. 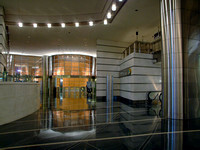 The mall sits under the two twin rocket like towers that house offices for high-end international companies. 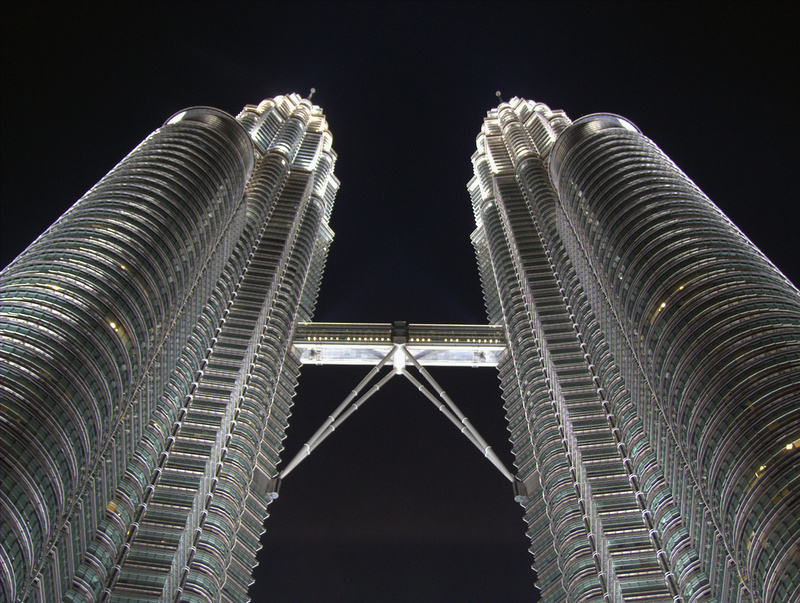 Tower one is fully occupied by the owners PETRONAS. Although a corporation of many divisions now, it’s legacy and wealth is established in oil. 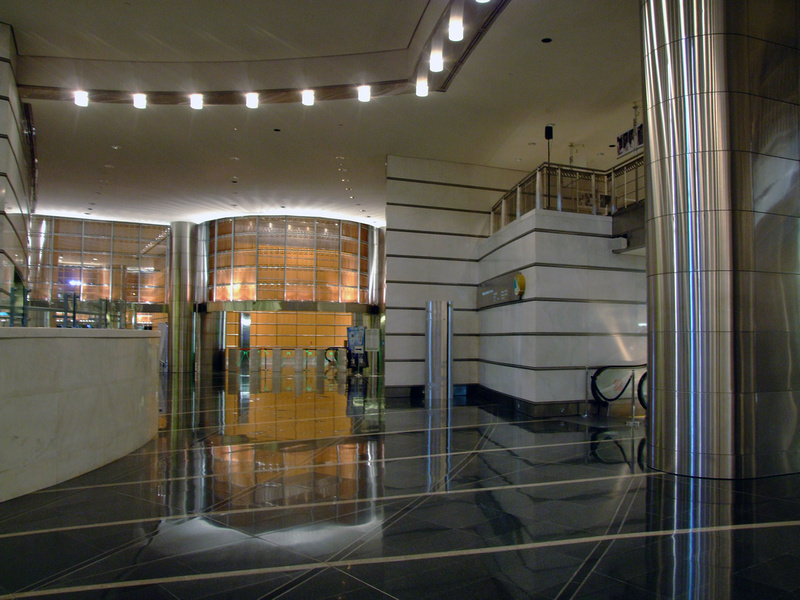 Tower two is occupied by many, including Accenture, Al Jazeera International, Bloomberg, Boeing, IBM, McKinsey & Co, and Microsoft. I don’t know what the rent is at Petronas towers, but, I imagine it’s more than what most people earn in a few years. Unless you’ve been in a bank after hours, the closest thing to watch high-end security like that of Petronas is to watch the film Entrapment. Or, James Bond in a high tech baddies lair. 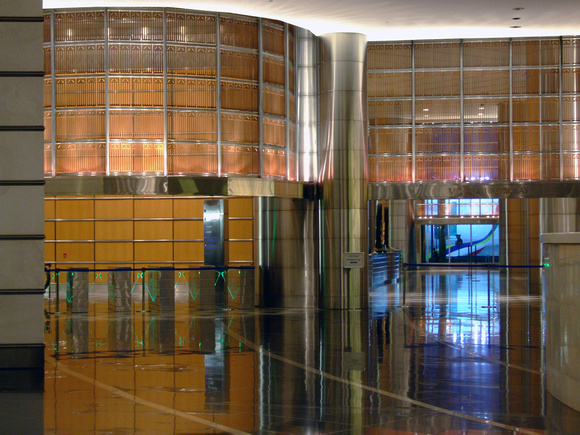 Magnetic Control Systems created a high-end security system for Petronas. Electronic ID pass cards, voice photo identification systems, along with closed circuit cameras, proximity readers, air gates, laser sensors and alarms monitor vehicles and pedestrians alike. There’s a 24 hour fire service, in-house. And a company sized IT department to keep the buildings communication systems working without fail. The towers have been designed to withstand earthquakes, and many experts have theorized that they would be able to withstand a 9/11 style attack. These rocket looking towers are trend setting not only in design, but also in security. There’s a concert hall and cinema, so if there is a film, or even a showing there is still access in and out to these areas. Meanwhile up in the towers, offices close as they would anywhere else. Private firm personnel are able to come and go, albeit under tighter security. Meanwhile in Suria KLCC shopping mall there is a full force cleaning crew at work, and quite interestingly a hive of activity from after store workers setting up for the next day. So efficient is this system that mini vans drive in to re stock stores. Set up center mall displays. And, run inspections. Make no mistake about it. There is more money here than in many small countries. Lexus’, BMW’s, Limos, and all manner of any shade of black big cars wait for executives to come down from the offices. At this stage, I’ve seen enough. There’s simply just too much money on display here for my liking. And, watching executives come down after working hours to these cars, drivers waiting, simply grates a little with me. In a world of celebrity politicians, I don’t even want to think about celebrity corporate stars. For the benefit of those asking for a generic Petronas photograph! I think what goes on inside is more interesting! I’ve not gone into detail about Kuala Lumpur for a reason. I’m trying to play catch up to my journey. A lot is going on personally, and I need some time to write it down. It’s an unexpected bolt from the unknown. So I must keep moving. I do like Kuala Lumpur. But, there’s something not right about the place. What goes on show, is not how life is there. Not even remotely. From fast swathes of illegal immigrants, to human rights violations there’s a lot going on beneath the surface. And, to be honest, I don’t know if I want to pry much further. I do know I’ll be back. For now though, this city of huge ethnic diversity will continue to shine on. Again with photographs of this place I have never seen before. Then that famous one at the bottom. Nice work in bringing us something different. Love the first photo, looks like Entrapment like you said. How did you get inside at night? Hi Shelly, There a window of opportunity in the evening when the place is near empty. I also helps to speak with someone. I’ve more photos but they’re in stock now. You deliver more than most blogs, its why I read. Will you ever go back to Spain? Spain, yes I imagine at some stage I will be there again. I think it would be nice to revisit some iconic places there to see how they have changed. So did you manage to go up the Sky bridge? I know they say it’s really nothing much up there but I’d really like to take a look myself! But too bad I failed to queue for the tickets, twice! Anyway it’s interesting to know how it the twin towers looked like after hours. Nice shot! Yes I went up. Managed to get a pre-lunch ticket :) I thought the 3D show was a headache, and I would have liked a view from the top. But, all the same it was nice to do. Didn’t think it was worthy of a whole post! Might put something up a little later on the how to section! Interesting post and I like the introspective points about Kuala Lumpur. I have never been, but it is on my list. It’s worth it for a couple of days Ted. Nothing too overwhelming, but refreshingly easier than say Bangkok. Beautiful pictures as always. That’s one of my favorite destination and then the temples of Angkor Wat. Are you going there too? I think I’d be lying if I said I won’t be going to Angkor, especially since I am so close. What quite I will do there, I don’t know. hope that you can easily sort things out for yourself. but this, this huge excess of money and corporate stuff, it’s sickening. when so many are in extreme poverty in the same country, it’s hard to take. great shots, of after hours! Thanks Jessie, the poverty gap is blatant in Malaysia, Brunei and … well everywhere these days. It’s seems to have taken a backseat to many other global issues unfortunately! I hope you are doing well. Ha ha, yes I promise this should be the last post about Petronas! I just wanted to capture it in a way no one else has. Hopefully the robbers didn’t learn too much! Hope you are still enjoying Egypt! I have been following you blog for a while primarily because of your photography. You seem to have the ability to arrive at a tourist spot, and take a photograph from a different perspective. You also write very, very well. My question is, do you plan on writing about how to go about photographing famous places, like Petronas, differently? I think you have a talent there, and would like to see more. Thanks for the kind words Jan. This was one of my main objectives for going to the Petronas Towers. To photograph them in a way no one else has. The three articles I’ve written about them illustrate this, and I am pleased with the results including the feed back. I keep meaning to write about photography, but there are plenty of other people out there writing like this. I don’t get paid for doing any of this, and my hands are tied with limited resources and time. Other wise I would, and it may just fit into an ebook update or the like. You had me going there for a minute Dave. I thought you may have donned the Ninja outfit and were about to scale the external of the building. As a mere mortal myself, it was hard to get any other shot of the towers other than the stock standard one. At least yours is at night though, I couldn’t be bothered hanging around. Erm, some complaints alright, see last paragraph. Dude did you steal my photograph! lol I had to seriously look at yours and compare it to mine! To funny! Love that last pic… Such gorgeous buildings. Thanks for posting! Eu adorei este blog,já morrei em Malasya foi uma experiencia fantástica,conheci lugares lindo mas não sei nome,um abraço da brasuca.